What is the difference between a cougar and a mountain lion? The American mountain lion once ranged over much of North and South America, and was given many names. Mountains lion, cougar, puma, catamount, panther, or painter. If you have heard of one of these animals, then you know them all, for these are just some of the many names for the same animal – the mountain lion. The tawny-colored mountain lion once roamed from the forests of Canada to the southern tip of South America. It lived in mountains, deserts, forests, swamps, and prairies. In South America, it is called a puma. 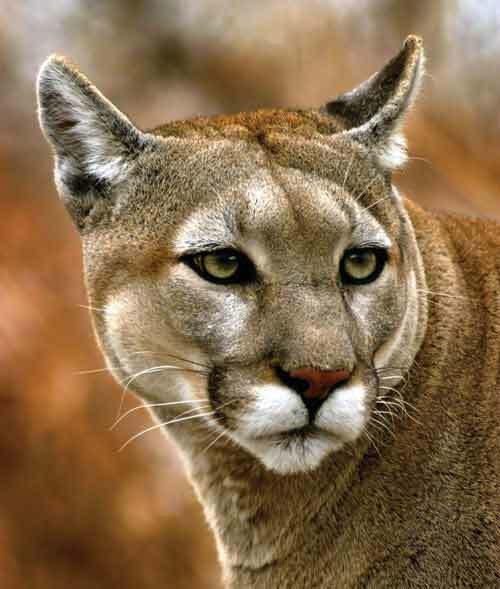 “Cougar” comes from the way French-speaking people pronounced the Indian word for mountain lion. Catamount comes from an old New England expression, “cat-a-mountain.” And “painter” comes from the way some people pronounced panther. The mountain lion’s “roar” is a wild and tarrying scream. Mountain lions also “talk” to each other with soft whistle calls. Because it sometimes kills livestock, many people regard the big cat as an enemy to be destroyed. We usually think of rodents only as small, gnawing creatures, such as squirrels, rats and mice. But can you imagine a rodent as big as a large goat? The capybara is. In fact, it is the largest rodent living today. 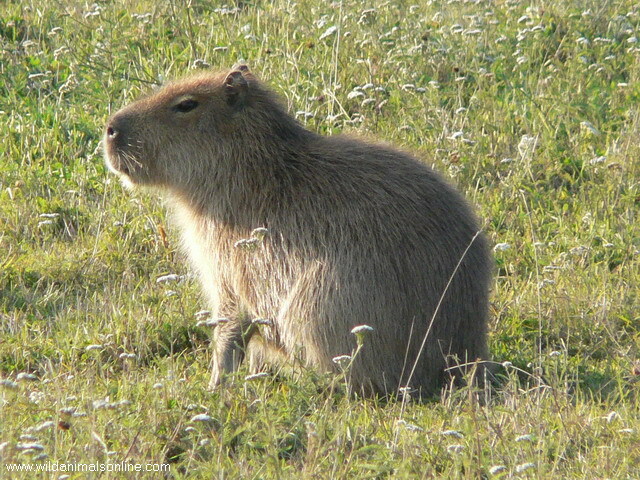 When fully grown, a capybara may be as long as four feet and weigh over 100 pounds. It resembles an overgrown guinea pig. Its thick body is covered with coarse, reddish-brown hair. It has webbed toes and almost no tail. This big, water-loving rodent lives along the banks and rivers and lakes in South America, where it feeds mainly on water plants and other vegetation. At the slightest sign of danger, the shy capybara plunges into the water, often remaining below the surface for several minutes. Peccary (pronounced PECK a ree) is a wild animal that looks very much like a small, tailless pig covered with thick, bristly hair and it has a piglike snout. Peccaries live chiefly in the forests of South America and can be found as far north as southern rooting in the ground for much of their food and eating roots, fruits and worms, as well as insects and poisonous snakes. Peccaries avoid people if left alone. If cornered, they can fiercely defend themselves with their sharp teeth. With their keen ears and noses they are difficult for the hunter to find. 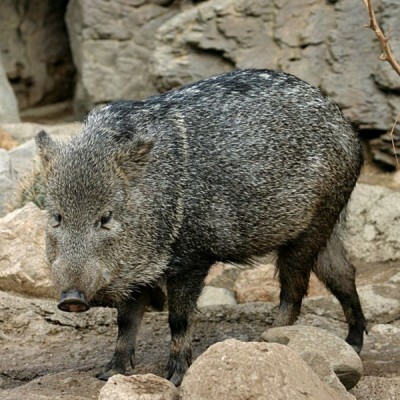 When disturbed, peccaries give a barklike alarm call and make a rattling sound by chattering their teeth. A sloth is a curious, slow-moving animal that lives in the wet forests of South America. The sloth has a small, roundish head and long, shaggy fur. It spends most of its life hanging upside down, holding on to the branches of tree with its hooklike claws. It does everything upside down. As it hangs suspended from a limb, the sloth eats nearby leaves and buds. It even sleep upside down. 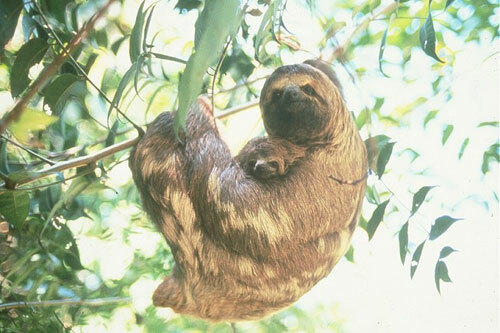 Tiny green plants called algae often grow in the sloth’s long hair, making it hard to see in the trees. The sloth is famous for the slowness with which it moves—its highest “speed” is only several feet per minute along a branch. This slow-motion animal almost never comes down from its tree home,. It can only creep along the ground with difficulty. The jaguar is a large, fierce cat related to lions and tigers. With its yellow coat marked with many dark spots, the jaguar looks very much like the leopard of Asia and Africa, but the jaguar is heavier. 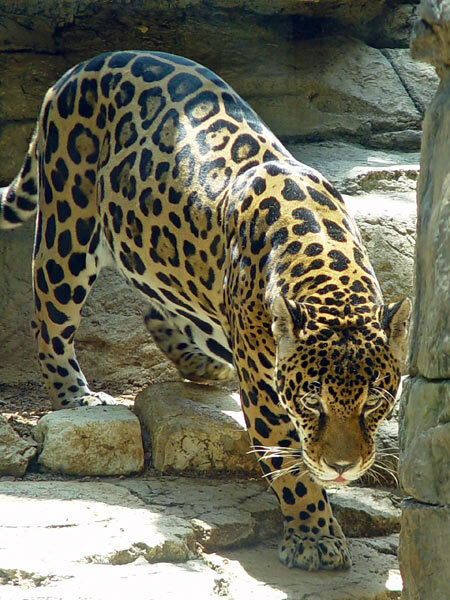 Jaguars live in the jungles of Central America and South America. The jaguar can also be found in Mexico, where it is known as “el tigre” (the tiger). A male jaguar may grow to be nearly 8 feet long including its 2 ½ foot tall and may weigh up to 300 pounds. It is powerful and fast enough to capture such animals as wild pigs, cattle and alligators. It is capable of attacking a man—if it is hungry enough. What are condors and where do they live? Condors are large, dark vultures that can be found living high up in the remote parts of the California Mountains of North America, and in the higher mountains of South America. A condor may grow to be over 4 feet long and have a wingspread of nearly 11 feet. It is one of the largest flying birds in the world. The condor is useful to man as an animal garbage collector. It helps keep the ground clean by feeding on dead animals which otherwise might present a health danger. 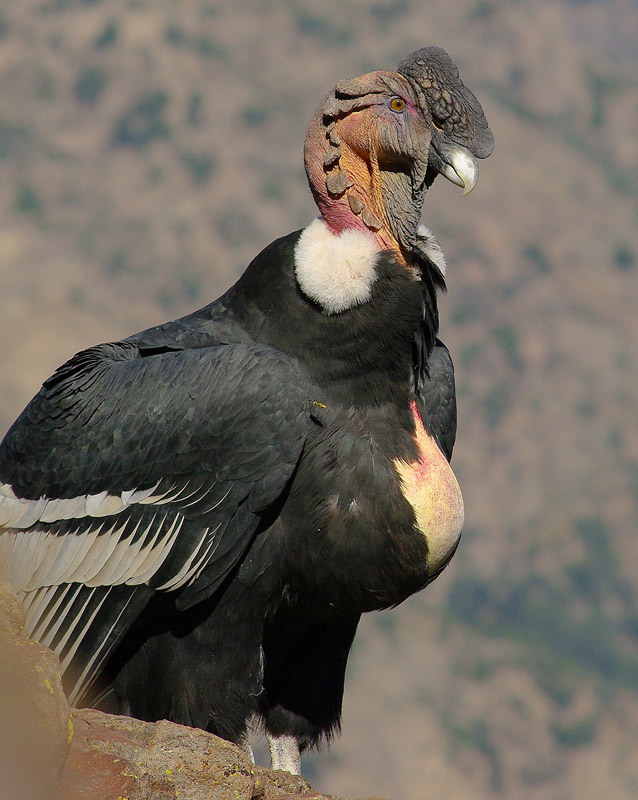 Like all vultures, condors have small, naked heads and hooked beaks. 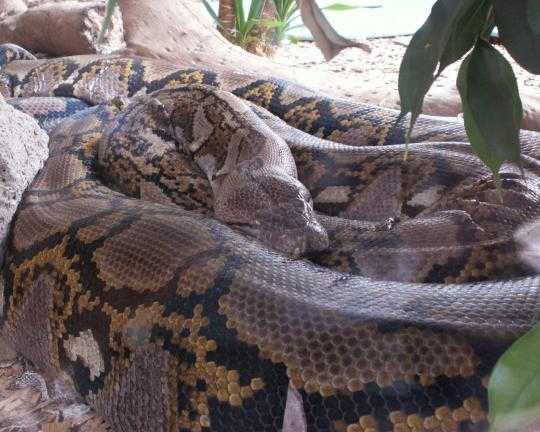 They have no voice, but hiss like a snake when disturbed. Though ugly to look at, condors are powerful and graceful in flight. They spend much of their time wheeling and circling high overhead searching for food. Their remarkable eyesight can spy out the smallest dead animal from great heights.